We won’t lie, we’re all about upping the number of dapper dudes in YYC and that’s exactly how and why our Scotch & Socks event was born. Upgrades to your wardrobe, small bites and an informal whisky tasting equal a whole lot of fun. Did we mention the free socks? What is Scotch & Socks? Scotch & Socks is a men’s focused event held bi-annually at espy. We close down the store to the public and let guys have exclusive access to the entire store for an evening of private shopping. Guys receive one-on-one attention from an espy stylist. They’ll use their expertise to assist and determine what you’re after and what you need to make your wardrobe complete. Office attire, weekend attire or outfits for an upcoming trip, they’ll get you sorted out for the season ahead. 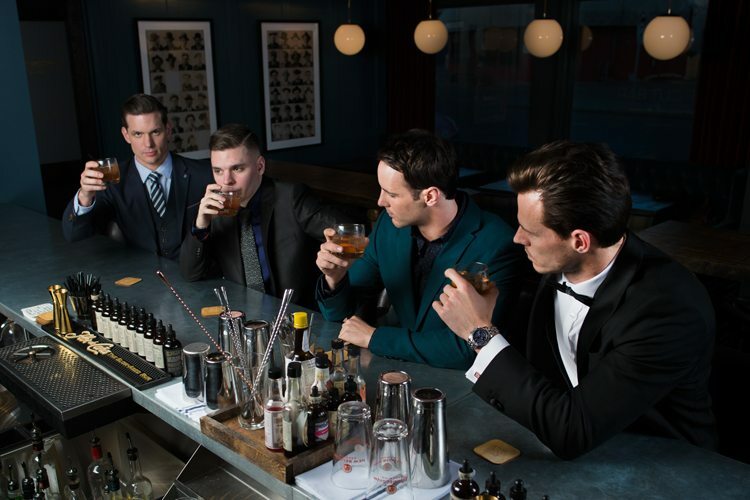 Before and during the styling session guys are treated to an informal whisky tasting. We fill your glass up with the top recommendations from some of the best scotch sommeliers in the city. Tasting notes included. Meat, cheese, bread. We’ve yet to meet a group of guys that weren’t down for a deadly charcuterie board while they shop. Guys receive 13% OFF all purchases made that evening and a free pair of socks of their choosing. As always, our in-house Master Tailor will be on hand to pin any alterations and provide expert advice to any inquiries you might have. Scotch & Socks events usually last 2-3 hours and we’re happy to book you a table anywhere you like for your next stop afterward. Here’s what you’ve got to do to make sure you’re at the top of the invite list next time around. Come in and let us shop for you! The more we get to know you, the better equipped we are to pick your ideal threads every time you come through the door. We’ll have your email address on file to ensure prompt invite delivery. Follow us on Facebook and Instagram – @espyexperience. We’re very social. And we always send invites to our friends and followers. Skip steps 1 + 2 and book your very own private shopping party for you and the boys. Want to suit up your groomsmen within minimal effort? In need of a creative corporate client or team building event? We can handle all of it. Shopping with your boys is fun and easy when the espy stylists take out the guesswork and there are brown spirits and cured meats involved. Our sign-up is now live for our next Scotch & Socks on Thursday, April 11, 2019.